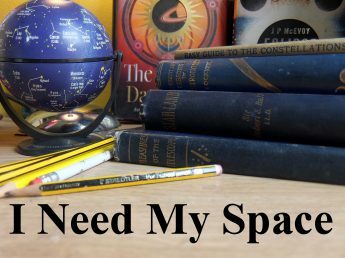 January | 2017 | I Need my Space! As the summer equinox approaches, it brings with it the onset of long daylight hours, and short, hazy, night-time summer skies. Many amateur astronomers screw their lens caps on tightly, and their telescopes go into hibernation till the winter. I’ve always thought this a bit of a shame; the summertime night sky can deliver some lovely astronomical sights. With this in mind, I thought I’d write a little about my own observations over the 2016 summer for Lyra, some of which will hopefully be of interest to society members. First, a bit of background about my observation sessions & equipment. I live in Chapel Ash, which unfortunately suffers from quite severe light pollution from the nearby city. Realising I needed to get away from the city lights to do any decent deep-sky astronomy, three years ago my dad and I renovated an old shabby ten-foot caravan, which I now use primarily for music festivals and astronomy (picture 1). It’s become an invaluable companion for my observing sessions. In it, I fitted a cooker, a heater, and the dining table folds down into a comfortable bed. It’s an ideal all-year round base. 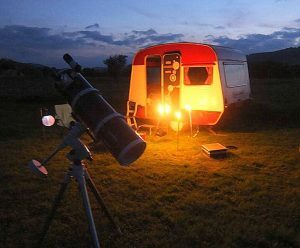 In the winter, if I get cold observing, I can nip in the caravan to get warm, and have a coffee or a wee dram whilst poring over my star charts. 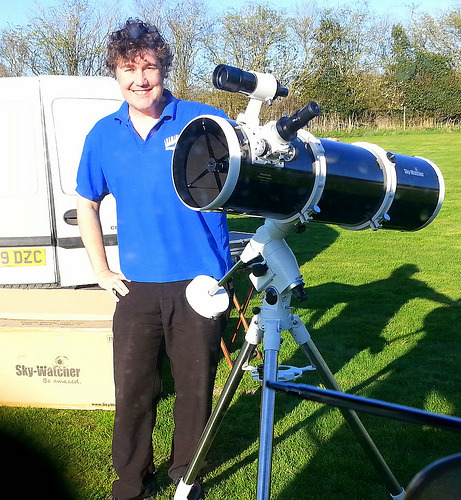 The campsites I use for astronomy are mainly in Shropshire, a short one hour drive away from the city lights. They all have full amenities; toilets, hot water, and they’re not by any busy main roads. I find camp sites are much better option than risking taking valuable equipment to local parks or commons, where you never feel totally at ease. I’d encourage any astronomer looking for dark sky sites to have a chat with a rural camp-site owner. You don’t even have to camp overnight to visit these sites. As long as the land owner gets their usual rent, (which averages seven pound a night), most are quite happy to let you use their land, (when I approach new site-owners, I sometimes even show them my Wolverhampton Astronomical Society membership card, I think this hopefully lends credibility). Several camp site owners have shown an interest in astronomy too, and most are proud of their dark skies. The telescope I’ve been using this summer is an 8 inch Skywatcher reflector on an EQ mount (picture 2). It’s replaced my 10 inch reflector on a dobsonian mount, (which I’m currently renovating, after its 20 year descent into shabbiness). The focal length and light gathering capacity is obviously less on the Skywatcher, but the optics are newer and much cleaner, and it’s a lot more portable. I’ve been very pleased with its performance this summer. At the last Wolverhampton Astronomical Society meeting before the summer break, fellow member Dave Wilson kindly laser-collimated the Skywatcher for me, so I was safely aligned, and more than ready to meet the summer’s night sky! With the long summer days, it can be quite frustrating waiting for the darkness to fall. In the first few weeks of June 2016, at sunset, three planets could be seen as naked eye objects as I faced the south. Jupiter, a bright beacon, to the far right, heading low. This would be its last showing before dipping below the horizon for the summer, (I’d been watching the Jovian ‘dance of the moons’ through May). To the left of Jupiter, the pinky ‘star’ of Mars shone dimmer, then a little more further to the left, the welcome sight of cream-coloured Saturn. Mars and Saturn would remain easily viewable, albeit low, throughout the summer, ‘swapping places’ as the summer months progressed. Mars, through my 8 inch ‘scope, didn’t show any disc markings this summer. Its low altitude, coupled with the temperature fluctuation as the air cooled, meant it was mostly an unrewarding sight for me. 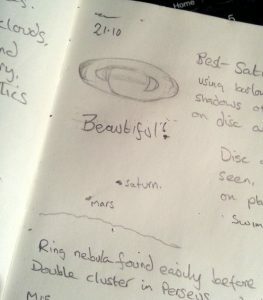 My notes in early June state ‘Mars is a small, bright, pink swimming disc, with lighter markings towards the bottom (top)’. Along with the craters on the moon, I think Saturn is the best thing to show the telescope newbie. I think they call it ‘the wow factor’. One night, in the last week of September, (so not technically summer, astronomically), the night was so still and clear, that my view of Saturn was quite stunning. I made a quick, (quite poor) sketch in my observation book, (picture 3), and I noted I could see cloud belts on the planet, shadows of the planet on the rings, and darker markings on the outsides of the rings, (I have yet to see the Cassini division through my 8 inch). I’ve seen this happen before with planetary observing. Bad seeing suddenly stops, and through a window of steadiness the detail on the planet (usually Jupiter) comes into sharp focus. The moral of the story, keep looking! Don’t assume that first observation will be the best of the night. In early September, I tried to locate Neptune, in Aquarius, using the sky map from Astronomy Now magazine, (September edition). In the light haze of the late summer, I found the constellation of Aquarius itself hard to locate. Eventually I found a blue-ish star where I thought Neptune should be, but without being able to resolve it into a tiny disc, I had to admit to uncertainty on finding this particular gas giant, (which mirrored my failure to find Uranus as a binocular object earlier in the year). The June moon appeared for a few nights, between other annoying nights of cloudiness. 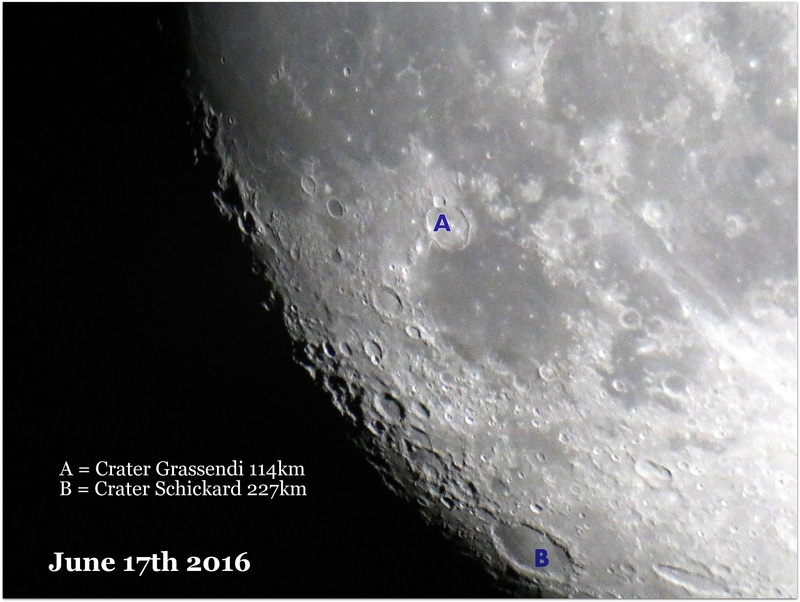 Using a Cannon EOS 750D SLR T-mounted on a 2X Barlow, I got this shot of a portion of the south-west side of the moon, a day or two before full moon (picture 4). 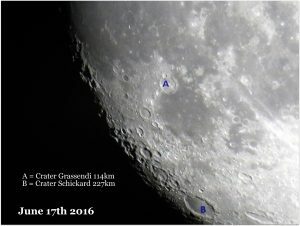 I’ve labelled a couple of craters for reference. I’m hoping to get much better lunar pictures through the winter. I’m new to astrophotography, and have been reading up on the various techniques. If anyone in the society has experience of astrophotography, I’d appreciate any advice, (or indeed, any feedback or comments on my observations). That’s all for now, in part two – the summer’s deep sky objects & double stars.